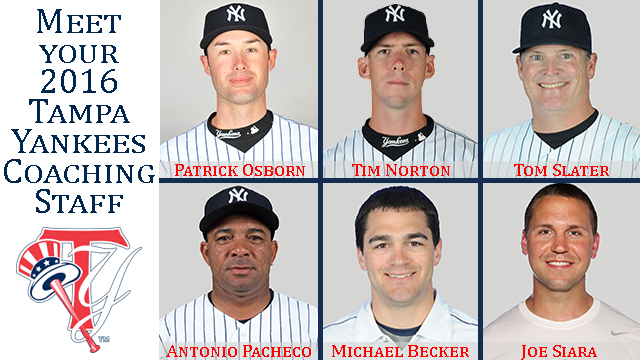 Tampa, Fla. - The New York Yankees Player Development office has officially announced the 2016 Tampa Yankees Field Staff. The team's new Manager will be Patrick Osborn with Pitching Coach Tim Norton and Defensive Coach Antonio Pacheco. Returning from the 2015 season are Hitting Coach Tom Slater, Strength and Conditioning Coach Joe Siara, and Athletic Trainer Michael Becker. Patrick Osborn enters his third season in the Yankees organization and his first with Tampa. He managed the Staten Island Yankees in 2015 leading the club to the NYPL Championship (41-34). In 2014 he managed the GCL Yankees and led the club to a first-place finish in the Northeast Division (35-25). He spent three seasons (2011-13) as manager of the Southern Maryland Blue Crabs, a member of the independent Atlantic League of Professional Baseball and led the Blue Crabs to three consecutive postseason berths. Tim Norton enters his first season as pitching coach for Tampa. He served in the same role for Single-A Charleston in 2015 where the pitching staff led the league in strikeouts (1,161). He was also the pitching coach for short-season Single-A Staten Island in 2014, helping Staten Island pitchers lead the NYPL in K/9.0IP (9.11). He made his professional coaching debut in 2013 as pitching coach for the GCL Yankees 2. Norton was originally selected by the Yankees in the seventh round of the 2006 First-Year Player Draft. He played for the Tampa Yankees for parts of 2009 and 2010. Tom Slater enters his eighth season as a coach or instructor in the Yankees organization and his second with Tampa. He most recently served as the Yankees' minor league hitting instructor in 2013 and 2014 and was Double-A Trenton's hitting coach in 2012, helping the Thunder lead the Eastern League in home runs and slugging percentage. He managed short-season Single-A Staten Island in 2011, winning the NYPL Championship. He also served as the GCL Yankees manager in 2009 and 2010, leading the team to a first-place finish in '09. Prior to joining the Yankees, he spent four seasons (2005-08) as the head coach at Auburn University. Antonio Pacheco enters his first season with Tampa after making his professional coaching debut in 2015 with GCL Yankees 1. He played in the Cuban National League from 1983-2001, batting .334 (2,356-for-7,045) with 1,258R, 366 doubles, 63 triples, 284HR and 1,304RBI in 1,853 games. He was a five-time Cuban National Series Champion as a player and is a two-time Olympic gold medalist (1992, 1996). Michel Hernandez enters his fourth season as a coach in the Yankees organization and his first with Tampa. He served as a defensive coach for Double-A Trenton in 2015 after spending his first two professional coaching seasons with the GCL Yankees 1. He was originally signed as a non-drafted free agent by the Yankees in 1998… played in 45 games in parts of three seasons in the Majors with the Yankees (2003) and Tampa Bay (2008-09), combining to hit .237 with 1HR and 12RBI. Michael Becker begins his fifth season as a trainer in the Yankees organization and third with Tampa. He worked with Single-A Charleston in 2013 and short-season Single-A Staten Island in 2012. He previously worked as an athletic training student intern at Triple-A Scranton/Wilkes- Barre during the 2010 season and graduated from Ithaca College with a B.S. in athletic training in 2011. Joe Siara enters his fourth season as a strength and conditioning coach in the Yankees organization and his third with Tampa. He spent 2013 with short-season Single-A Staten Island. Siara graduated in 2006 from Indiana University with a degree in kinesiology and exercise science. In 2008, he received a master's degree in human performance from the University of Florida.